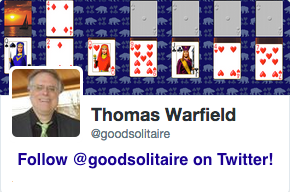 Goodsol Solitaire Blog: New Pretty Good Solitaire for Windows version 16 with 900 Games! New Pretty Good Solitaire for Windows version 16 with 900 Games! Version 16.0 is available for download from http://www.goodsol.com/download.html. Version 16.0 contains 20 new games, bringing the total number of games to 900. -- The 20 new games are Acute Triangle, Chatham, Cloud Nine, Easy Street, Empire Spider, Feisty Fifteens, Fortress Moat, Guildford, King of Egypt, Klondike Deal 2, Knitting Pairs, Reveillion, Scorpion Row, Seven Saints, Shaula, Spidike Light, Squares and Pairs, Thirteen Out, Volga, and Yukon Twice. -- There are two new larger card sizes, bringing the total number of card sizes to 7. These new sizes are called Huge and Gargantua and will only be available in large screen resolutions, such as over 1600 pixels horizontally for the Huge size and over 2000 for the Gargantua size. These card sizes are especially for large monitors or new high resolution Windows 10 devices. -- The Favorites functionality has been changed so that you can unfavorite a game from the Game menu as well as favorite it. In addition, when you move the game from one computer to another, the favorites will now move along with all of the other settings and data in the game's data folder. -- There are several new larger font sizes on the main screen list of games to make showing the list of games better. To change the main screen font size, go to the Options menu on the main screen or click on the club suit icon to cycle through all the card sizes. -- This is the first version actually developed in Windows 10, so there are a lot of small changes to make the game work better in Windows 10. Of course, it still works in earlier versions of Windows going back to the old Windows XP. You can download Pretty Good Solitaire version 16.0 from http://www.goodsol.com/download.html . Or, if you have a previous version installed, you can run the game, go to the Internet menu, and select "Download Latest Version". Be sure to exit the game before you install. Pretty Good Solitaire version 16.0 is a free update for those who originally ordered version 14 (ordered after February 9, 2013) or those who paid for an upgrade since that time. However, it is not a free upgrade for those who originally ordered version 13 or earlier. "2r", version 15 was a free upgrade but version 16 is not. Full details on upgrading are at http://www.goodsol.com/upgrade.html. Upgrades are still only US$11.95 and are vital to keep us going to make Pretty Good Solitaire better. Note that we always keep some older versions available at http://www.goodsol.com/downloadpre.html for those who prefer not to upgrade. If you have lost your code and need to type it in again, you can request that your registration code be sent to you again from http://www.goodsol.com/regusers.html. 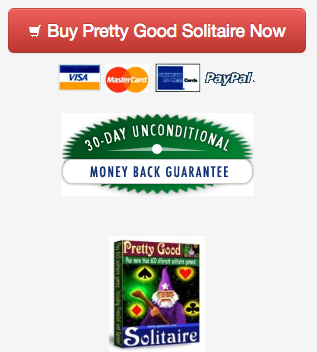 Pretty Good Solitaire version 16.0 is US$24.95 for immediate electronic delivery. If you want an additional CD, there is an option to add $9.95 shipping for a CD. In addition to installing the basic game, the CD also installs all of the currently available extra card sets. How long before rules for the new games are added the the rule section? I don't know, I'll try to get it done soon.